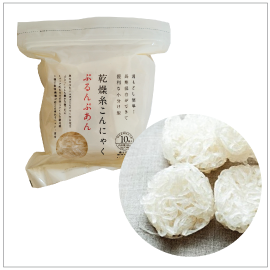 Konnyaku or shirataki typically sold in grocery stores comes fresh in water-filled pouches. This innovative new product is dried and super convenient to use. Indonesian konjac is used instead of Japanese konjac to give this noodle different texture and better absorbing properties. This low-caloric and fiber-rich healthy food is pesticide-free and does not contain additives. Soak in hot water for 5 to 7 minutes. Drain and rinse slightly.